Howard doesn’t come close to matching the other bell cow backs through the air in terms of volume, efficiency or drops. The air profile that Howard does match quite well is that of other run-heavy backs like Ajayi, Blount, and Hyde. He actually catches a lower rate of his passes than those players by a good margin, but is similar to them in terms of target frequency, yards per target, and drop percentage. That’s not to say that Howard is a bad player-all of these are solid NFL players-but it does limit his value. All of those players have settled into situational roles and not every-down duty, and I think Howard is probably destined for the same fate unless he can improve as a pass catcher. Hunt and Charles are the lead backs the Chiefs have used under Andy Reid (and LeSean McCoy was the lead back his last 4 years in Philadelphia). Notice they all get used through the air far more frequently than Howard has, and produce efficiently in that regard, in line with other top bell cow backs around the league. I find the Carlos Hyde comparison interesting. Howard is a better runner than Hyde, but actually pretty similar as a pass catcher. When Kyle Shanahan arrived in San Francisco last year, he installed a passing attack that incorporates the running back more, and Hyde’s usage in the passing game increased tremendously. He saw 88 targets (5.5 per game), dropped an astounding 14 of them (16%), and had his least efficient pass catching season both in catch % (67%) and yards per target (4.0). Coincidentally, Hyde was allowed to leave in free agency. If Howard sees something similar happen as he gets more involved in the passing game, I think it’s safe to say he won’t be in Chicago beyond his rookie contract. I do wonder if Howard’s low yards per target value is a function of 2017’s comically inept offense. 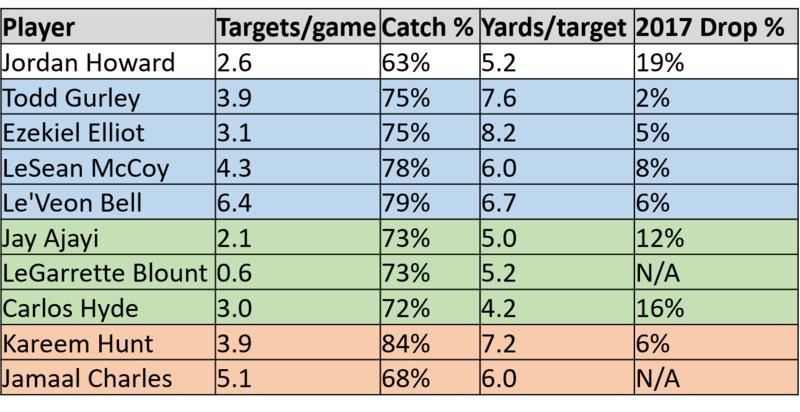 Tarik Cohen averaged only 5 yards per target last year, a number that I expect to rise to be more in line with the other backs on this table in 2018. Hopefully Howard sees a similar spike in production, though it’s worth noting he was only at 3.9 yards per target last year. One non-passing nugget I found on Player Profiler: through two years, Howard has averaged 6.0 yards per carry against nickel fronts, one of the best figures in the NFL. He had less than 20% of his carries against those fronts in 2017, but should see them much more often in this new offense. I am very excited to see him carry the ball in 2018. There were rumors the Bears considered trading Jordan Howard this offseason because of his limits in the passing game. He’s still a Bear, but that doesn’t mean those concerns have disappeared. If Howard can’t find a way to both be more involved as a pass catcher and become a more efficient weapon through the air, he is likely going to end up as a platoon running back. To his credit, Howard has admitted this is a problem and is working diligently with coaches to improve. Bears fans can only hope the hard work pays off.